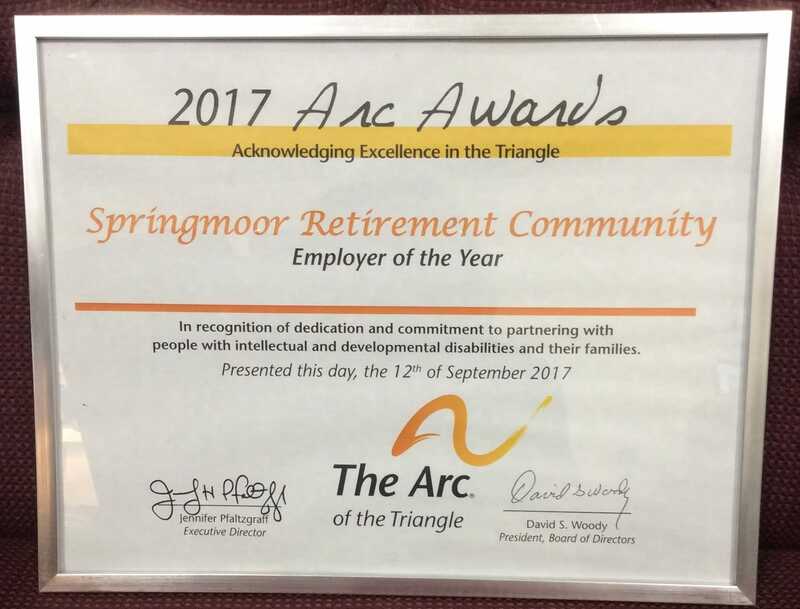 Springmoor is the proud recipient of the 2017 Employer of the Year Award from The Arc of the Triangle. 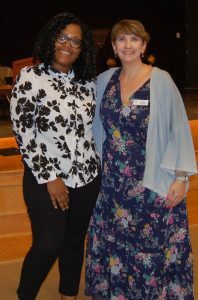 Demi Tucker, Springmoor’s Dining Room Manager, recently accepted this exciting award on behalf of our community. 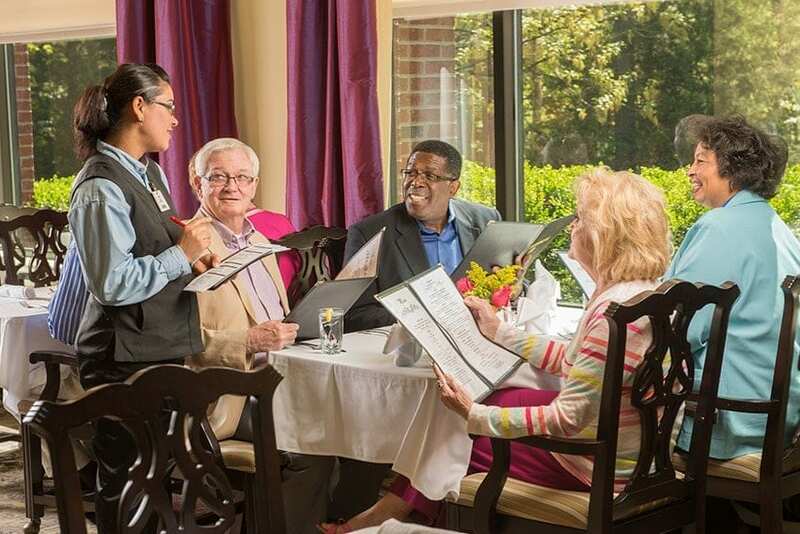 She says not only do The Arc participants add value to our dining room with their dedication and hard work but their fellow employees and the residents greatly appreciate their tremendous enthusiasm. The Arc, a national organization founded in the 1950s, was formed by a group of parents advocating for their children with intellectual and development disabilities. The grass roots organization now has over 700 state and local chapters. The local chapter, The Arc of the Triangle, serves Wake, Orange and Durham counties. Supporting over 500 children and adults, they offer a wide variety of programs including respite services, summer work programs, employment services and community guides. They also offer a wide range of classes and advocacy network services. Springmoor resident, Charlie Blanchard, served on the Arc’s Board of Directors for many years. He and his wife, Archie, continue to be huge supporters of this successful organization. 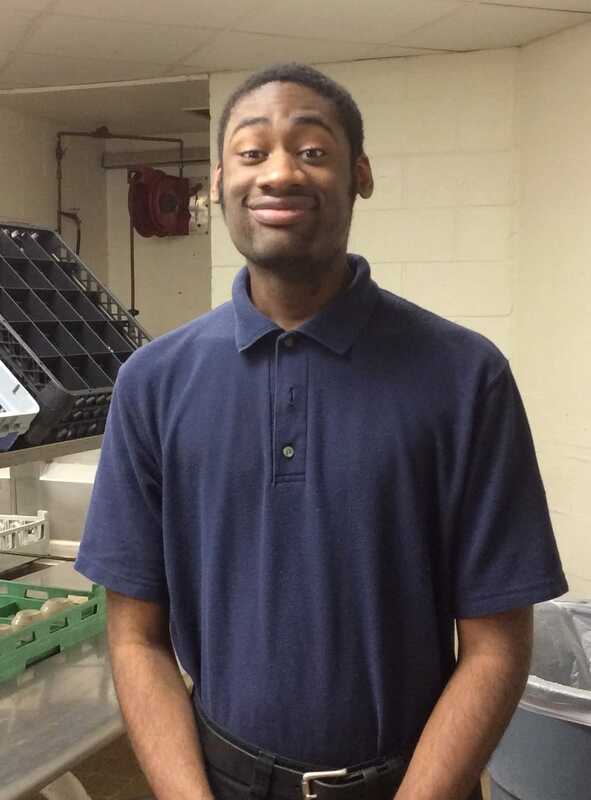 A student seeking employment may join the program during his or her high school years at age 17. The Arc continues to work with adults in this same program until they are 65. Each student is paired with a job coach that will help with training, job skills and future employment. The coach often accompanies the employee to their new job to help with on-the-job training. 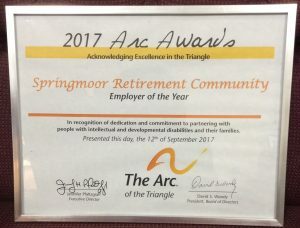 Tamela Haywood, The Arc’s Employment Specialist, told us that Springmoor has proven to be one of the best places for employment for her participants. 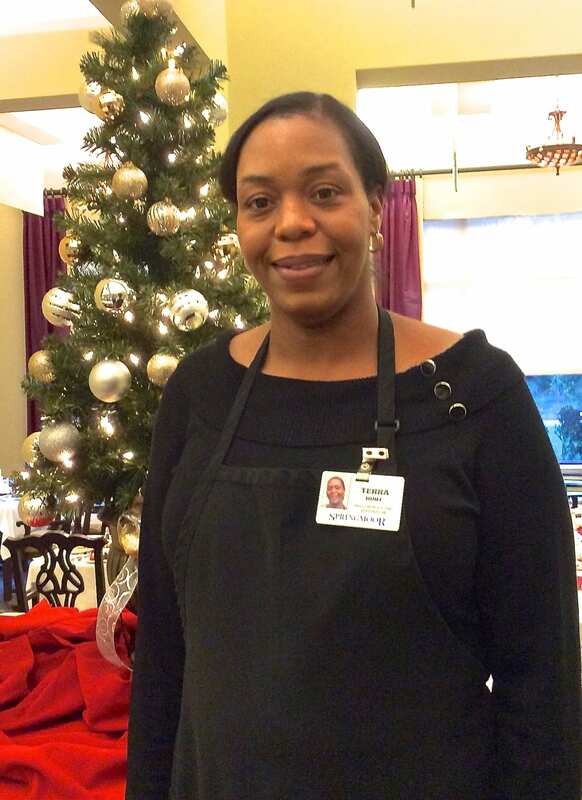 The three employees, Sally, Angel and Jeremiah, love their jobs, their fellow employees and the residents. Sally has been at Springmoor for twenty-nine years. Her smile will brighten anyone’s day! 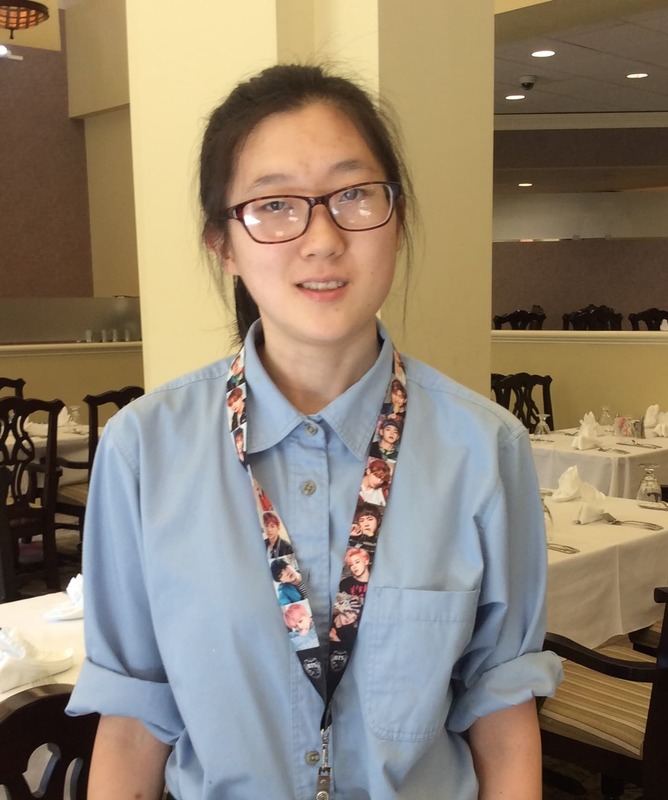 She is a dedicated employee that works in the North Village Dining Room as a line server. 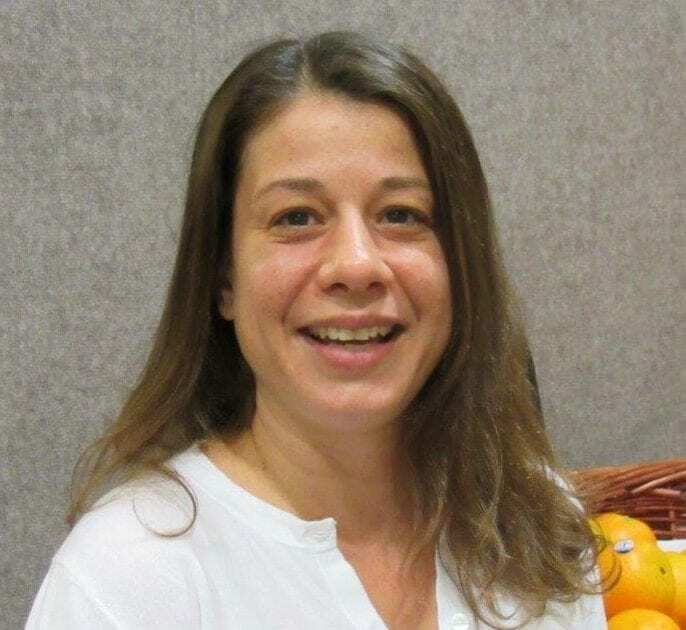 She also sings in The Arc’s choir that performs regularly for churches, civic groups and community events. Demi describes her as “very reliable, always on time and extremely detailed.” The dining room staff recently joined in a celebration for her 60th birthday. Angel, a 2017 high school graduate, came to Springmoor this past February. Starting as a very shy and quiet young lady, she has blossomed into a wonderful employee before everyone’s eyes. 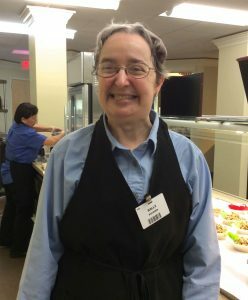 All of the residents will tell you they have seen a remarkable change as she became more experienced with the staff and her duties. She speaks both Korean and English. She too is very detail-oriented. Serving in the dining room, she fills orders from the drink stand as well as the dessert bar. She recently brought flowers to Demi from the Arc’s Petals with a Purpose program. It’s time for an All-American Independence Day. What’s better than apple pie or juicy slice of watermelon, a hot dog with all the fixin’s or a delicious hamburger with fresh lettuce and tomatoes? Top it all off with fireworks and baseball and you have the perfect summer day! 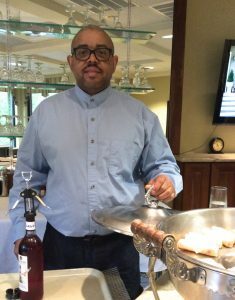 Art Ernteman, Springmoor’s General Manager of Dining Services, was asked what’s on the menu for our July 4th Celebration. 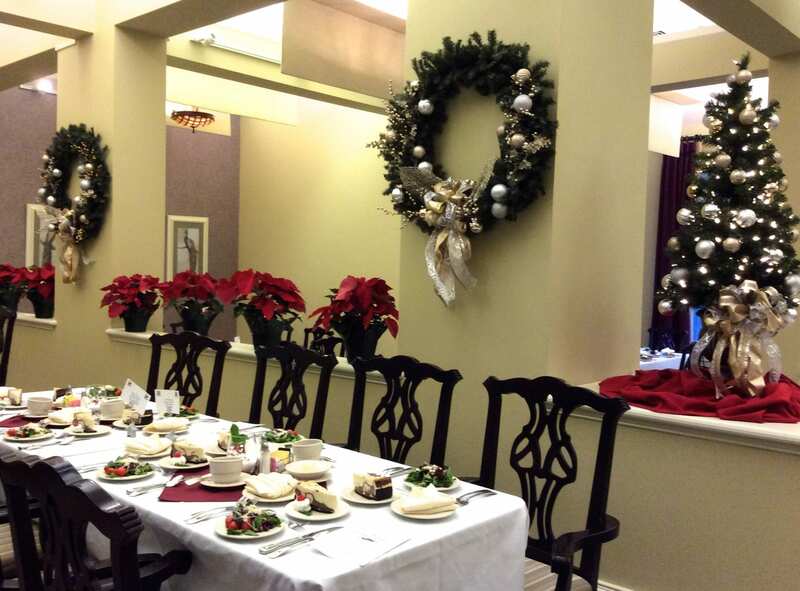 Of course, he is serving everyone’s favorites and adding a touch of stars and stripes to the dining rooms too. Along with the burgers and apple pie, he’s added okra and tomatoes, grilled zucchini, potato salad, sweet potato fries, rotisserie chicken and baked beans to the menu. 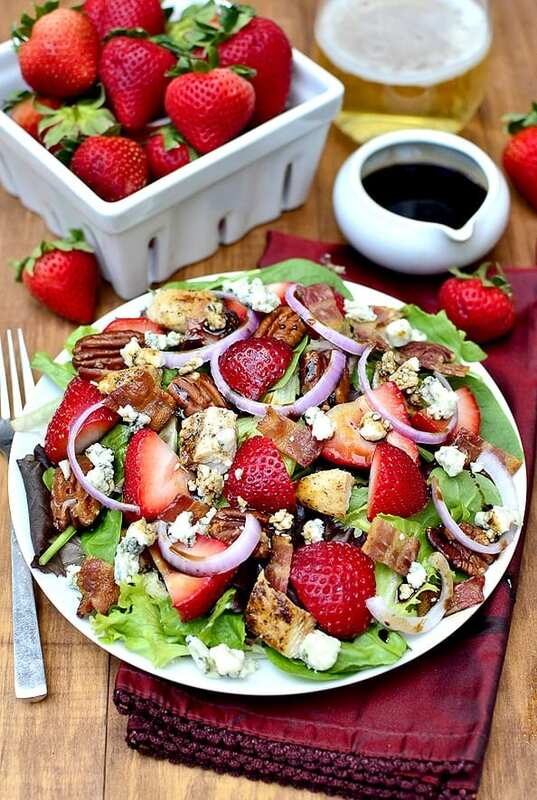 The July 4th menu will include one of everyone’s Springmoor favorites – Strawberry Fields Salad. 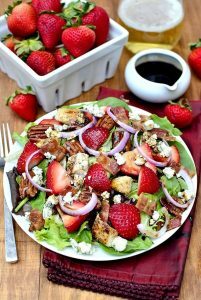 He says it’s easy to make and can be served as an entrée salad. We look forward to an afternoon get-together in the Garden Grill and The Terrace Room for a fresh slice of juicy watermelon before your evening activities. Are you entertaining family and friends this week too? Raleigh has a long list of local farms. Lyon Farms offers two choices: you can pick your own bucket of berries or drop by their neighborhood produce stand. A Creedmoor Farm since 1861, they bring their fruits and vegetables to the neighborhood during the growing season. They are located only a few blocks away on Creedmoor Road! For the best blackberries – and a day on the farm – you can pick your own from mid-June to the end of July. 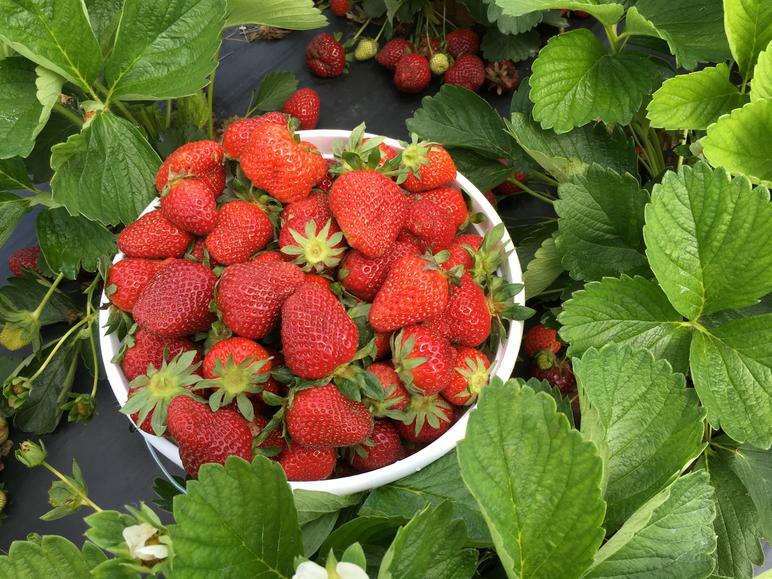 They have a large of assortment of fruits and veggies at the stand and also sell a few speciality items that you won’t want to miss: pickled items, strawberry lemonade, jams, cider and corn on the cob. Page Farms is located only a few miles away too. If your family is in town and you want to explore “a little bit of country”, they suggest you come for a visit. Blackberry season is in full swing now on their farm too. You can pick your own or buy them by the pound. 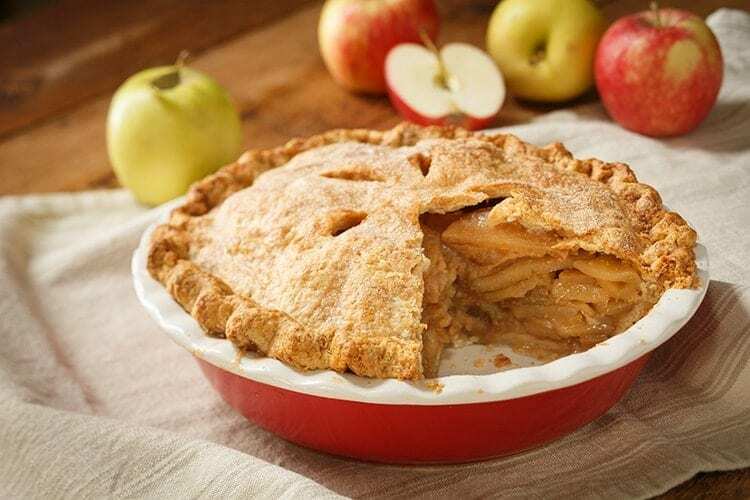 What’s more All-American than apple pie? How about a little minor-league baseball while your family is here? The Durham Bulls and The Carolina Mudcats have stadiums that are only thirty minutes away. Both teams are in town this week and have special firework events scheduled for their 4th of July celebrations after the game. 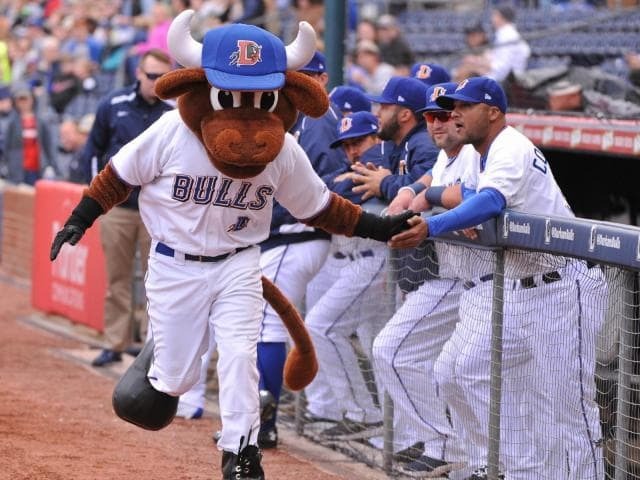 The Durham Bulls take on The Charlotte Knights at the DPAP in downtown Durham. And at Five County Stadium, in Zebulon, you will find the Mudcats and The Salem Red Sox. After a burger and a slice of apple pie, you and your family might want to head downtown to join in the Raleigh festivities. The ‘Works! begins at noon. There will be live music, Aerial Performances, Cirque de Vol street performers and more. The fireworks begin about 9:30pm. This great show always lights up the Raleigh skyline. 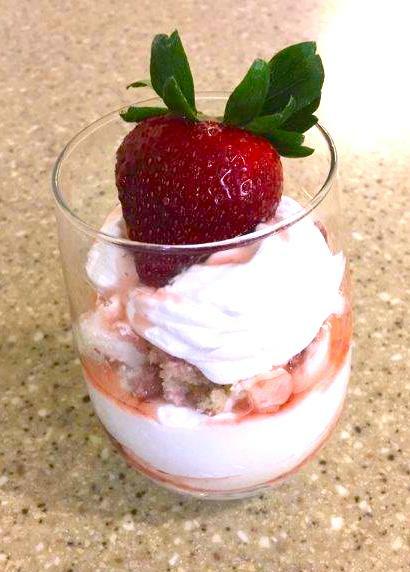 If it’s Wednesday, everyone knows the Dining Services will be hosting “Appy Hour” later in the afternoon. This popular event happens in North Village at The Springs and South Village at The Willow Springs, our residents’ hospitality bars. Before dinner the two rooms will fill with friends and a toast to a birthday, a new grandchild or a putting green win. The laughter can be heard from around the corner and down the hall. Join us! 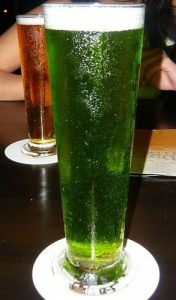 Each Wednesday at 4:30 the Bartenders are on duty and the hot appetizers are being served. The menu can feature Mini Crab Cakes, Potato Skins, BBQ Meatballs, Chicken Tenders, Chicken Wings or a new weekly hors d’oeuvre from the Chef. 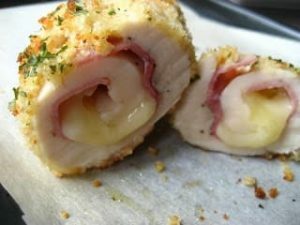 The favorite is always our delicious melt-in-your-mouth Chicken Cordon Bleu Bites with a touch of ham and Swiss. David, Dominick, Mitchell and Nate are our outstanding Bartenders. Wednesday is one of their busiest days of the week but they welcome residents every evening before dinner. The tables are painted with a board for chess or checkers and await a friendly competition between residents. The Bartenders keep the refreshment bowls filled with little nibbles and look forward to serving you with your favorite beverages. 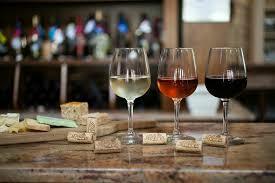 Beer and Wine Tastings are scheduled throughout the year. Saint Patrick’s Day brought a variety of green beers to the offerings. Beer from Neuse River, a local brewery, was sampled at a beer tasting event in the early spring. The brewery sent a representative to explain the brewing process and help us understand the differences in taste. Red or White? What’s your favorite? Each quarter, the residents are treated to a Wine and Cheese Social in The Springs and The Willow Springs. Luke Campbell, our Dining Services Director, has brought his wine expertise to these wonderful events. Luke tries to make the event a tasting one as well as a fun night out. 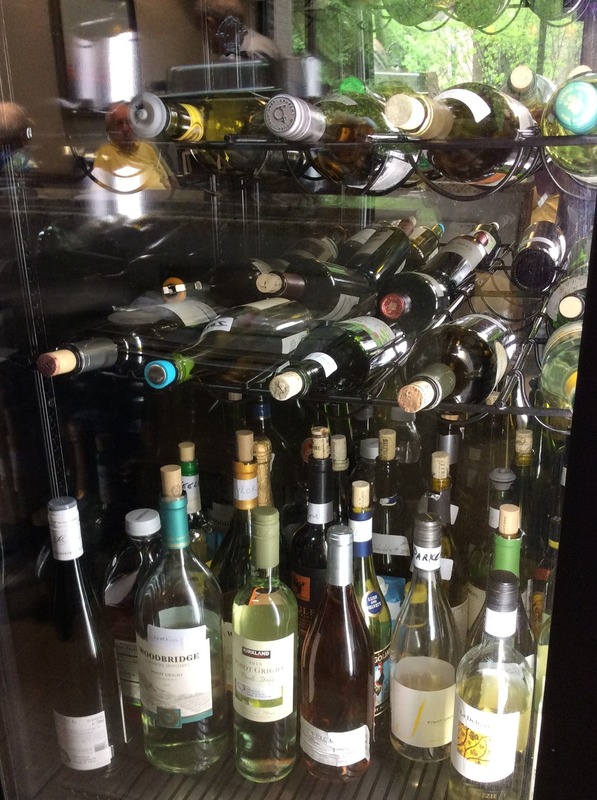 Albert Callaway, a Springmoor resident, tells us that he “enjoys the fellowship not only with the residents but the staff members who handle the events.” He has visited wineries in both North Carolina and California. 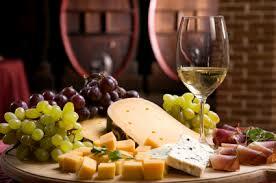 He said he is always interested to learn more about the wines and cheeses and has bought a few that Luke has served. 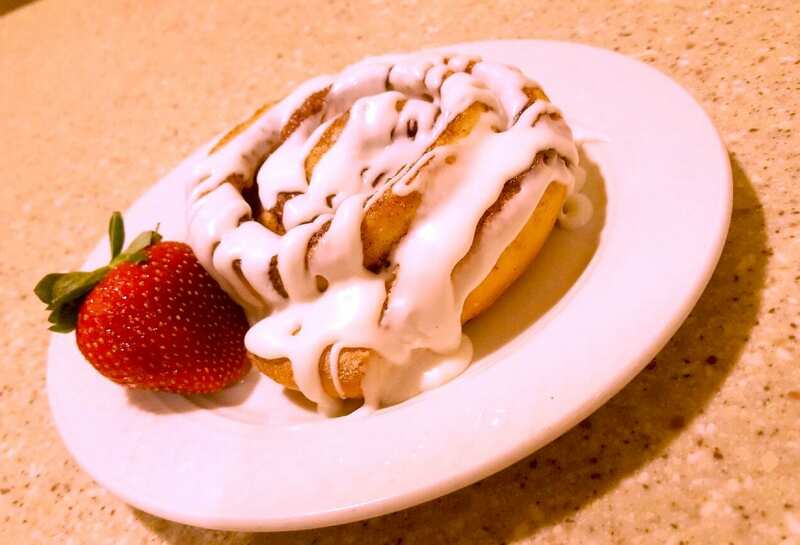 There are always other delicious appetizers to enjoy too. 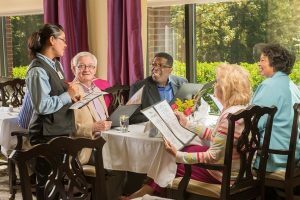 Our dining service makes this a perfect evening to welcome new neighbors and catch up with friends. 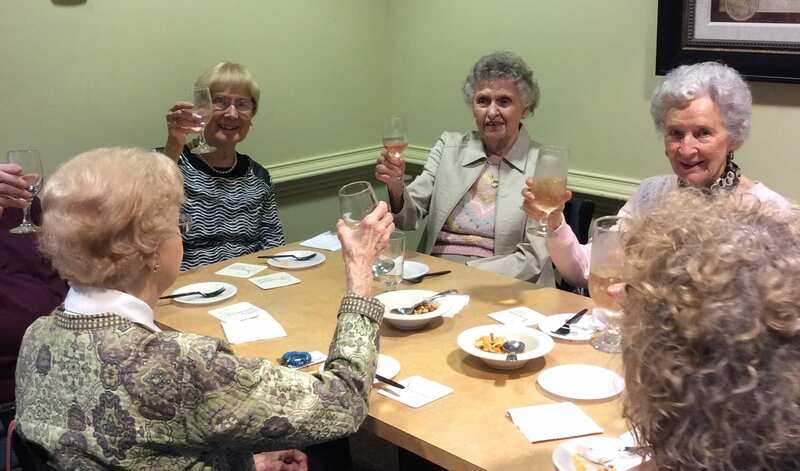 The Springs in North Village and The Willow Springs in South Village are always filled with an overflowing crowd for this enjoyable social event.